Under the environmental management system to promote our sustainable environmental management, decision-making efforts for environmental measures and those for business operations are inseparable. To realize sustainable environmental management, it is essential to pursue environmental conservation and business operations under a united decision-making scheme instead of implementing two separate, sometimes incompatible missions. The Ricoh Group promotes sustainable environmental management by incorporating the environmental management system (EMS) as an essential process of each business activity. We established a system to reflect the environmental action plan set by the management in the goals of respective organizations and provide feedback on the results of their actions to management. Under the system, the Group as a whole, and each of the organizations, promotes the plan-do-check-act (PDCA) cycle. In addition, we operate the Sustainable Environmental Management Information System, designed to identify and promote the progress of sustainable environmental management. The collected data are processed and analyzed to identify the integrated environmental impact of overall operations; draw up environmental action plans; support decision-making in sustainable environmental management; promote environmentally-friendly design; improve activities by each division; and disclose information to the public. At the Ricoh Group, we have been working to develop and improve environmental management systems (EMS), initially on a business site basis, to accelerate our environmental conservation activities. Starting with the Ricoh Gotemba Plant, which received ISO/DIS 14001 certification in 1995, all major Ricoh production sites worldwide were ISO 14001 certified as of March 2000. Then in 2001, the sales group in Japan as a whole gained ISO 14001 certification. Sales subsidiaries other than those in Japan are also making every effort to acquire ISO 14001 certification. The Group has thus promoted the creation of a climate for sustainable environmental management by all employees through the acquisition of ISO 14001 certification. Since February 2007, in an effort to fuse business and environment and pursue environmental management, our business site-based EMS worldwide were revised to become business division-based, placing business activities and environmental protection activities under a single decision-making process. In tandem with this initiative, Ricoh and its sales subsidiaries in Japan have acquired integrated ISO 14001 certification. Moreover, in December 2013 accreditation was completely integrated within Japan, governance was strengthened while at the same time a rationalization of accreditation business was conducted. * For the status of the Ricoh Group's ISO 14001 acquisition, please visit "Ricoh Group's ISO 14001"
The Ricoh Group is making an effort to improve sustainable environmental management based on an "all-employee participatory approach." This "all-employee participatory approach" means that all employees in all divisions—such as R&D, product design, materials procurement, manufacturing, transportation, sales, maintenance/services and collection and recycling—articipate in environmental activities. These activities are regarded as just as important as "QCD activities,"* which involve pursuing profitability. To improve environmental activities, internal benchmarks and know-how are provided to all employees from time to time to make them more environmentally aware. * QCD activities improve the management of Quality, Cost, and Delivery. The Ricoh Group carries out risk management as an inner control function using the PDCA cycle based on the Ricoh Group's Total Risk Management Basic Rules. For initial measures taken in case of crises*, the Rules clearly define the sections in charge and reporting levels according to the different crisis categories. In line with the Rules, pertinent incidents are reported to the president and relevant officers, then necessary measures are taken based on the president's policies. When an environmental crisis or an incident that seemingly will lead to an environmental crisis occurs, initial actions, including reporting and reception of information, instruction, actions and discussion, will be carried out as indicated in the accompanying flow chart. * Crisis: an incident with a risk that continues and/or increases in size to the level at which the corporate operation of the Ricoh Group is severely affected. The Ricoh Group Sustainable Environmental Management Information System was launched in Japan in 2001 and on a global scale in 2002 to foster sustainable environmental management. Ricoh established this system with a view to reducing the lifecycle environmental impacts of its products, including not only the environmental impact of the activities of Group companies, but also from the procurement and manufacturing practices of the Group's parts suppliers and during use of its products by customers. In order for a company to effectively conduct environmental management through a PDCA cycle, it is crucial to collect precise environmental performance data. It is, however, difficult for a company to measure the environmental impacts caused by a number of suppliers and the impacts resulting from the use of its products by customers, although it is possible for the company to obtain precise data about its own direct environmental impact. The company, however, cannot set specific environmental targets if it does not make an eco-balance assessment because it is difficult to collect precise data. 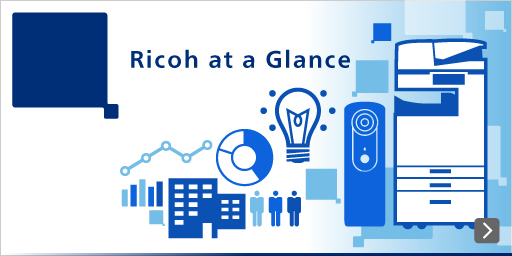 To deal with this problem, Ricoh has classified the environmental performance data collected, including actual results and sample values, which vary in precision level, into levels 1 to 3 and has been working to improve data precision for each of the levels. Also, in accordance with the business growth of the Ricoh Group, we have expanded the scope of data collection on a global scale to include businesses and companies newly joining the Group. We have thus strived to improve both the data precision and scope. We make effective use of the collected environmental performance data in every aspect of sustainable environmental management, for example, in preparing and managing environmental action plans and promoting environmentally friendly design. We also use the data for annual environmental reporting and for the appropriate disclosure of information about our use of chemical substances and product recycling. In recent years, companies have been required to manage a huge amount of data on chemical substances to ensure compliance with the REACH Regulation, for which our existing information system infrastructure has proved to be very useful. The Ricoh Group is promoting green purchasing, which promotes the active use of environmentally-friendly products, as a user of paper, stationery, office equipment, etc. In April 2002, the Ricoh Group formulated Green Purchasing Guidelines in Japan for eight categories: paper, stationery, office equipment, OA equipment, home appliances, work gloves, work uniforms, and lighting. Production and non-production sites outside of Japan are also promoting green purchasing by establishing their own standards.